Cherrie has been having a great time exploring Wellington, as it’s a very walk-able and roll-able city. We’ve been all around the CBD, over to Oriental Bay, up to Zealandia and even back out to the airport for an evening function –with nary a step or curb along the way. It’s really been grand. Plus I have to give the folks at the I-site (visitors center) a big thumbs up on access — they are actually familiar with wheelchair-access in their fair city. But since it’s a important to learn about the culture of the places you visit, we spent a little time taking Cherrie to Maori sites, so she could learn about the rich and interesting culture. We started on our first day with a traditional Maori welcome ? the Powhiri. 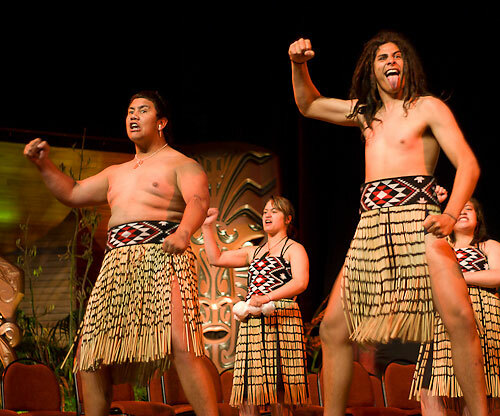 This is a very sacred ceremony to the Maori, and it involves the exchange of speeches, song and dance. There is much symbolism involved, and the ceremonial salutation (Hongi) includes a handshake accompanied by the pressing of the nose and forehead between the Maori and the visitors. It was a very interesting and colorful ceremony. To learn more about Maori history we then headed over to Queen’s Wharf and visited the Museum of Wellington City and Sea. 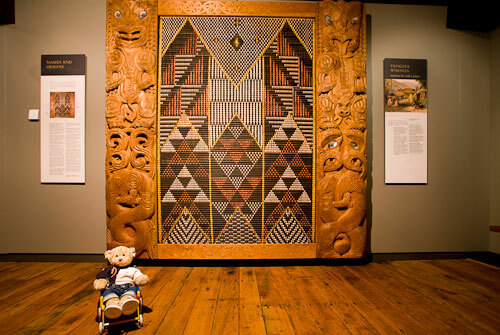 The third floor had an excellent Maori exhibit, which included a large tukutuku (woven panel) flanked by decorative poupou (carvings). The former describes the natural features of Wellington harbor, while the latter illustrates the creation and discovery of the land and harbor. Cherrie was really wowed by this, as she had never seen anything like it before. And it served as a good primer for the other Maori sites that we’ll visit during the trip. In the end, it’s been a great trip so far — one that is certainly doable for wheelers and slow walkers. Like I said earlier, I was impressed with the access in New Zealand some 10 years ago, and I’m even more impressed on this visit. Cherrie is having a very easy time navigating down here, and I expect that to continue on the next leg of our journey. So put New Zealand on your travel wish list — it’s definitely a destination for everyone! This entry was posted in Destinations, Traveling Cherrie and tagged accessible travel, barrier-free travel, New Zealand, SATW, Traveling Teddies, Wellington, wheelchair travel, wheelchair-access by Candy B. Harrington. Bookmark the permalink.